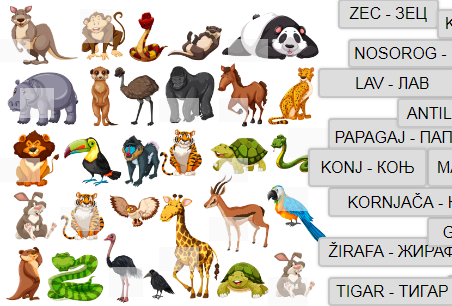 Before we start practicing the Accusative and Genitive case with animals, let's learn a set of words in a fun way. This is a drag and drop exercise which will help you learn the words both in the Latin alphabet and Cyrillic script. Have fun! (make sure you pull the word a bit further to the left of the designated square in order for it to "catch" it).